The Bangladesh Bank has decided that commercial banks will not be allowed to purchase or lease for 10 years or more any lands, buildings and floor space for any purpose other than use by their head offices. Name the latest trend going for salwar kameez, sari and panjabi — and you are likely to find them in the boutiques in Chittagong. They are trying to attract as many Eid shoppers as possible. To avoid the mad dash that invariably occurs closer to Eid, many have started with their Eid shopping from the first day of Ramadan. Akram Khan looks sheepish. The question that he has been asked is one to which he feels he must say yes, but he is not sure yet how best to express himself. He thinks for a moment, and then does an excellent job. So, is performing in the opening ceremony the biggest honour in his life so far? For a few seconds Michael Phelps seemed completely bemused. He just had completed a great race at the pool and yet had to settle with only a silver medal, his first in three Olympics. There are positives to be taken out of Bangladesh’s just-concluded tour to Europe, believes batsman Tamim Iqbal, despite the two losses to Scotland and the Netherlands. Bangladesh A earned three points from their drawn opening match against Baroda Cricket Association XI in the Shafi Darashah cricket tournament at the KSCA ground in Alur yesterday. Neymar ran to the sideline and struck the famous Usain Bolt lightning pose. It was football’s biggest Olympic star honouring one of the London Games’ most acclaimed athletes. Theatre troupe Swapnodal will pay tribute to Nobel laureate poet Rabindranath Tagore, dramatist Selim Al Deen and Indian director Badal Sircar by organising a six-day theatre festival beginning tomorrow, informed the organisers at a press conference held on Monday at the seminar room of Bangladesh Shilpakala Academy. A number of aspiring young actresses who were launched through the “Lux Channel i Superstar” talent hunt, are now busy in the media. These artistes have all the potential to carve out successful careers and may well dominate the media by dint of their talent and hard work. A wholesome family-oriented TV show, “Ittyadi”, with innovative ideas, conveys social messages and generates awareness among the masses all with a dash of entertainment. Special episodes of “Ittyadi” during Eid bring up interesting choreography which adds to the extravaganza. 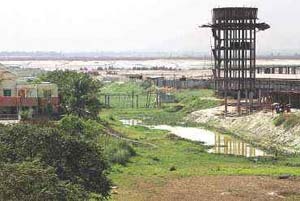 The government has legalised two illegal private housing schemes and is going to okay at least four others to the destruction of natural wetlands and rural homesteads on the capital’s north-eastern fringe. Prime Minister Sheikh Hasina yesterday said the World Bank could not present evidence for the graft allegations over the Padma bridge project. Ruling out the restoration of caretaker government system, Prime Minister Sheikh Hasina has suggested forming a “small cabinet” including the opposition ahead of the next parliamentary polls.